Sri Seth Bisan Chand, a retired politician who lives on the parikrama marg the next block over from the temple, invited Srila Prabhupada and some of the devotees for lunch today. Prabhupada was all smiles as Mr. Seth happily greeted our party, and after receiving several garlands Srila Prabhupada was led into a side room where Seth had laid out a dozen sitting places and leaf plates. About nine devotees accompanied Srila Prabhupada – Bhagatji, Pradyumna, Arundhati and Aniruddha, Akshayananda Swami, Jagadisa, Mahavira, Dhananjaya, and myself. It’s always a pleasure to honor prasadam with Srila Prabhupada. Mahavira Prabhu was especially excited because it was his first time. He told me that it was like something he had imagined, like a scene one reads about in the Caitanya-caritamrita, the guru sitting at the head and his disciples sitting in front in lines going down on either side of him. Mr. Seth served a small portion of each preparation to Srila Prabhupada first and then to everyone else. Mahavira made a point to follow exactly what Srila Prabhupada was doing. When Prabhupada took his chapati, tore off a small portion, used it to scoop up a small portion of rice and subji, and pop it into his mouth, Mahavira did the exact same thing. He followed as closely as he could, but by the time he was already full, Prabhupada was still eating. 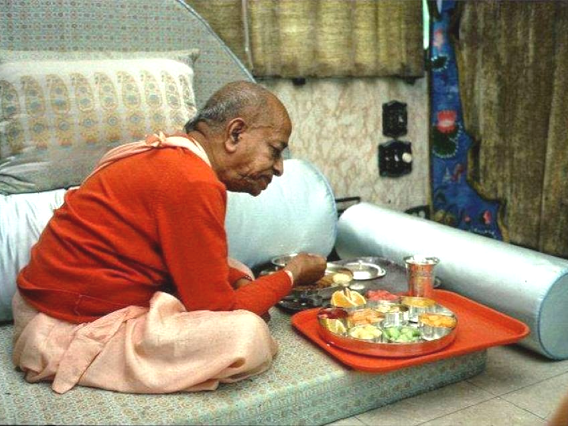 I was happy to see Srila Prabhupada display a good appetite; he ate quite a bit more than ususal. It was a convivial gathering with many pleasantries exchanged. After sitting for a few minutes after lunch, Prabhupada and his small entourage returned back to Krishna-Balaram Mandir.